Pulmonary function testing is essential for diagnosis and treatment-guidance of chronic obstructive pulmonary disease (COPD). Airway obstruction as assessed by spirometry should follow the reference-values provided by the Global Lung Initiative (GLI) of the European Respiratory Society (ERS). In addition, lung function testing should also include the assessment of lung hyperinflation and pulmonary emphysema by full-body plethysmography and determination of diffusion capacity. This is important since both, lung hyperinflation and pulmonary emphysema, can present without existing airway obstruction. Even though this formally excludes the diagnosis of COPD, these entities still belong to this disease complex. However, strictly speaking, pharmaceutical treatment is valid only for those patients with co-existing airway obstruction according to Global Lung Initiative for Chronic Obstructive Lung Disease (GOLD) criteria – since the absence of airway obstruction serves as exclusion criterion in nearly all randomized controlled trials. Nevertheless, progressive symptoms still require detailed pulmonary function testing for the guidance of non-pharmaceutical treatment – such as endoscopic or surgical lung volume reduction, long-term oxygen therapy, long-term non-invasive ventilation, and lung transplantation. Die neuen GOLD-Empfehlungen zur chronisch obstruktiven Lungenerkrankung (COPD) sollen helfen, für jeden Patienten die geeignete Therapie zu finden. Allerdings werden hierbei z. B. geschlechts- und altersabhängige Unterschiede vernachlässigt, obwohl die Referenzwerte der Global Lung Initiative (GLI) diese bereits berücksichtigen. 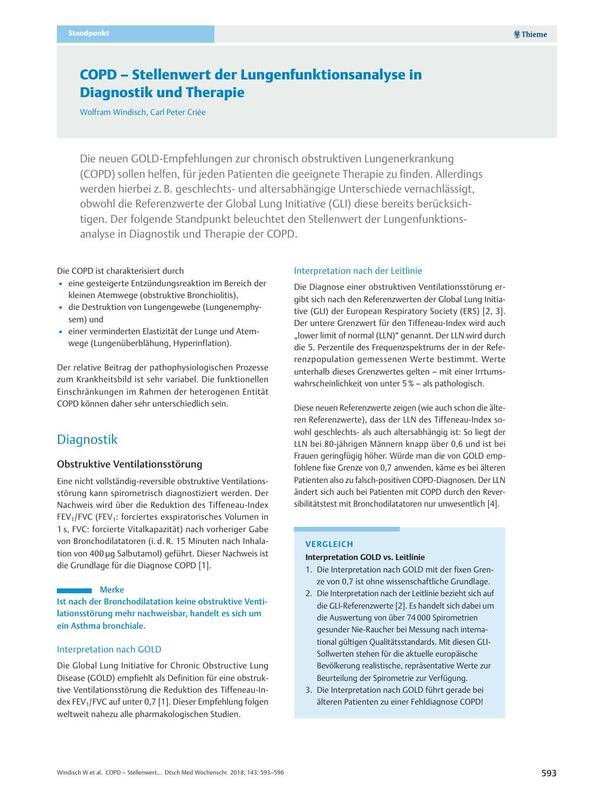 Der folgende Standpunkt beleuchtet den Stellenwert der Lungenfunktionsanalyse in Diagnostik und Therapie der COPD.